This is the adorable moment a kindhearted stranger gave some food to a hungry dog - only for her to run off and feed it to her puppies instead. 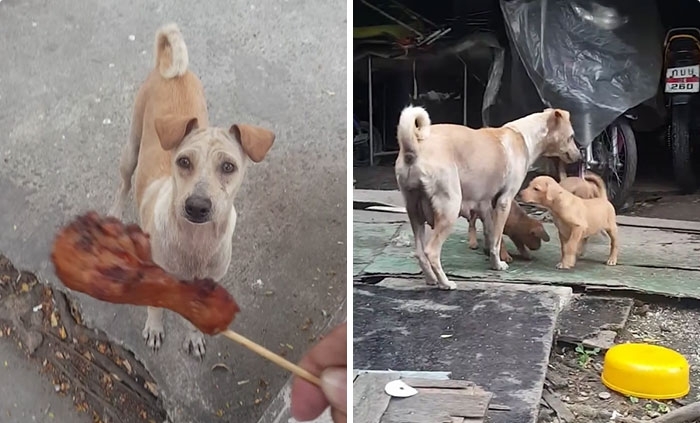 The ravenous dog was given some meat on a stick by a caring animal-lover in Bangkok, Thailand, who expected her to wolf it down for herself. But the dog scurried away with the food between her teeth - and was later seen handing it to her four children. In the cute footage, the dog is seen happily taking the meat and running off through a market. The kind stranger follows the dog as it scampers along, before eventually reaching a garage. Four puppies then spill out of the building and start tucking into the dinner their mother has brought home. After one particularly hungry youngster runs off with the treat, the other dogs run up to the man to thank him. The man is seen stroking the family as they all wag their tails, with the mother dog looking up to him in hope of more food. Responses to "Man Gives Starving Dog Some Food, She Brings Food Back to Her Babies"
Heartbreaking how thin they are... It worries me so much. Hope they are well.